Photo of the Pokrovskii Sobor (popularly known as Sobor Vasiliia Blazhennogo, i.e., St. 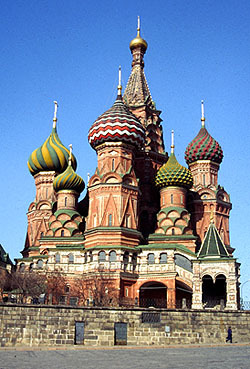 Basil's Cathedral), Moscow on Red Square, constructed between 1555 and 1561 by architect Postnik Yakovlev. This is the HIS 241 course syllabus (home page). On this page, you will find important information about the course and the links to the course assignment schedules. Ivan Turgenev, Fathers and Sons (Signet Classic, ISBN 9780451529695, although any edition is acceptable). This course reviews the history of Russia from earliest times to about 1900 and introduces students to the developments of medieval and imperial Russia. Students will examine the major themes and issues that have defined Russia's past and also study some Russian cultural achievements in areas such as art, architecture, music, theater, dance, literature and philosophy. Establish a chronology of historical events in Russia before 1900. Obtain a knowledge of the historical geography of Russia up to 1900. Define the importance of key individuals and developments in Russian history before 1900. Identify the social, economic and political forces at work in the historical development of medieval and imperial Russia. Recognize and describe the significance of some of the cultural achievements in medieval and imperial Russia.